What Is The Generic Name Of Aciloc- 150mg? 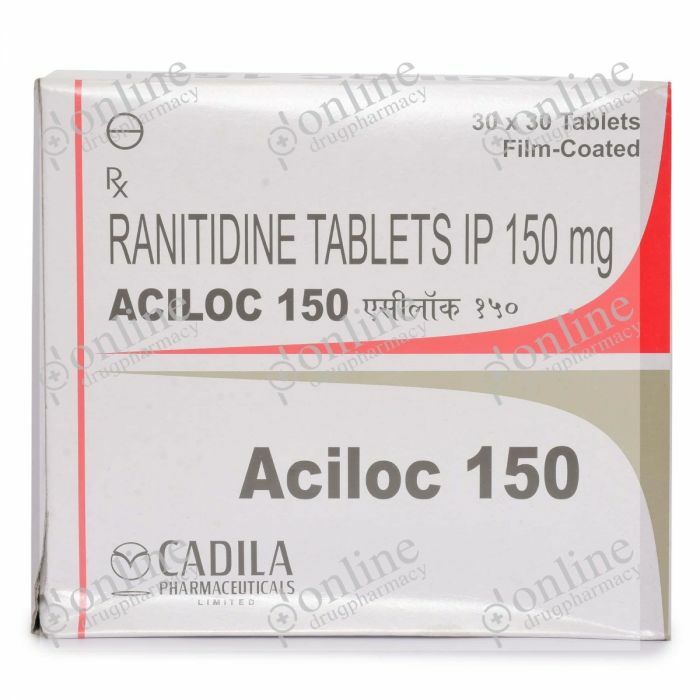 The generic name of Aciloc- 150mg is Ranitidine. Aciloc- 150 mg is an antacid, anti-reflux, and anti-ulcerative. It is manufactured by Cadila Pharmaceuticals and is available online, at leading Drug stores and medical supply shops. It is also available internationally by other names. It is manufactured by Cadila Pharmaceuticals and is available easily at online pharmacies, leading drugstores and all medical supply stores. Aciloc is available in the strength of 150 mg.
How Aciloc- 150mg (Ranitidine) Works? Aciloc- 150mg works by reducing the acid production. It is a histamine receptor antagonist. It doesn’t neutralise the acid produced instead reduces the production, thus relieving the patient. Inform your doctor about any allergic reactions. Tell your doctor if you are on any other medications especially anticoagulants. Tell your doctor about your history of kidney or liver disease. Inform the physician if you plan on conception or being pregnant. What Should I Avoid While Taking Aciloc- 150mg (Ranitidine)? Consult your doctor and follow his advice regarding meals and dosage. When Not To Use Aciloc- 150mg (Ranitidine)? Have an allergic reaction after taking Aciloc-150mg or if any of the side effects occur. Adults: 150 mg twice per day. Children: 5-10mg/kg body weight per day in two divided doses per day. Adults: 150mg four times a day. Children: 5-10mg/kg body weight in two divided doses per day. Adults: 159mg twice per day. Aciloc- 150mg is a tablet which is taken orally with or without meals. How Much Of Aciloc- 150mg (Ranitidine) To Use? It should be taken for as long as prescribed. It is either prescribed for short term or long term, if not followed then it might cause serious implications. How To Take Aciloc- 150mg (Ranitidine)? Swallow Aciloc- 150mg as a whole. For How Long Should I Continue Using it? One should take Aciloc- 150mg as long as directed by the doctor. In case of an overdose, immediately call the doctor and consult. Consult your doctor. If a dose is missed, the effect of the drug might decrease as a certain amount of medication needs to be in the body at all times to be effective. Procainamide, Warfarin, Midazolam, Triazolam, Glipizide - increases the chances of side effects. Atazanavir and Gefitinib make Aciloc-150mg less effective. Aciloc-150mg should only be taken when prescribed by the doctor, and the full course should be taken for the specified time. History of any other medications, especially anticoagulants. Always consult your doctor before taking the medication. Take it for the prescribed time, and the full course should be taken. Aciloc- 150mg is widely used and is available online, at leading drugstores and all medical supply stores. It is used treat stomach or duodenal ulcer, erosive esophagitis, oesophagitis reflux disease, and hypersecretory disorders like Zollinger Ellison syndrome. Follow the dose prescribed by your doctor according to the disease and your age. It should be taken orally with or without meals. Swallow Aciloc- 150mg as a whole without chewing, crushing or breaking it. To avoid side effects, use Aciloc- 150mg according to the prescribed dose.